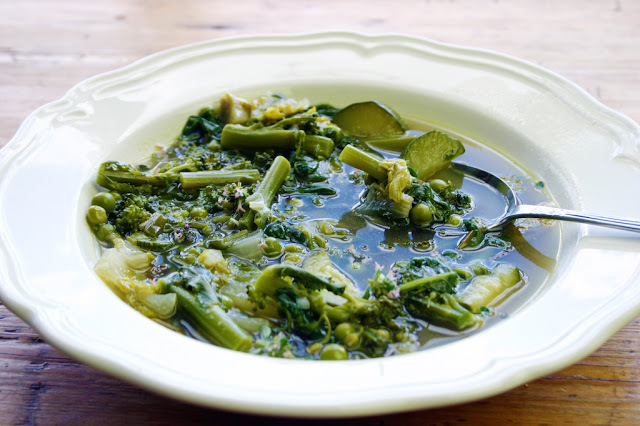 Welcome to the Round Up for 'Eat Your Greens' #14. 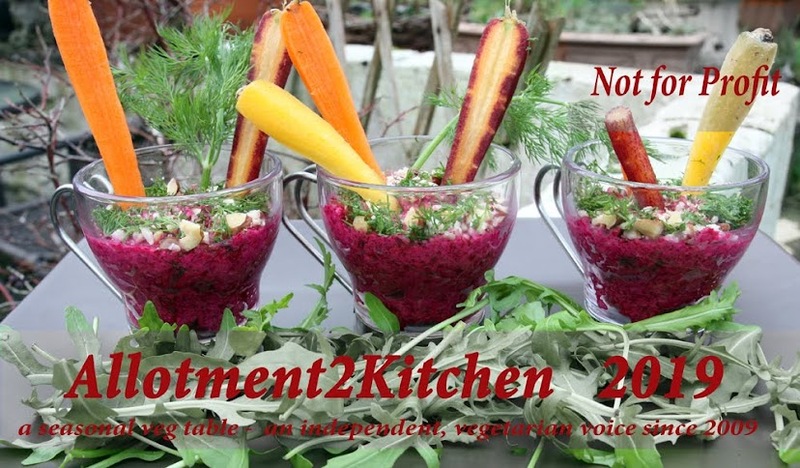 This is a monthly vegetarian and vegan cooking challenge for food bloggers to make something with a green vegetable (or fruit) each month. First up we have Corina from Searching for Spice with Chimichurri Peas. 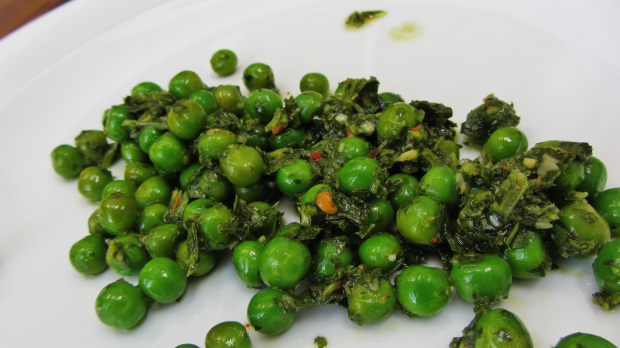 What a fantastic way to jazz up some fresh or frozen peas. Want the recipe go check it out. Janet from the Taste Space shared with us Fresh Tofu and Strawberry Sal;ad with Mosto Cotto. The greens here are cucumber and salad greens. 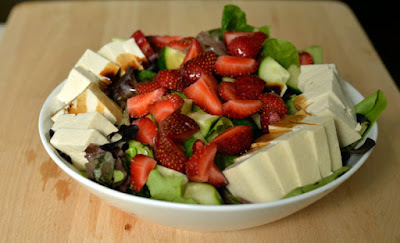 Intrigued by the fresh tofu and Mosto Cotto, then go by her blog to find out more. Next we have Kate from The Veg Space. 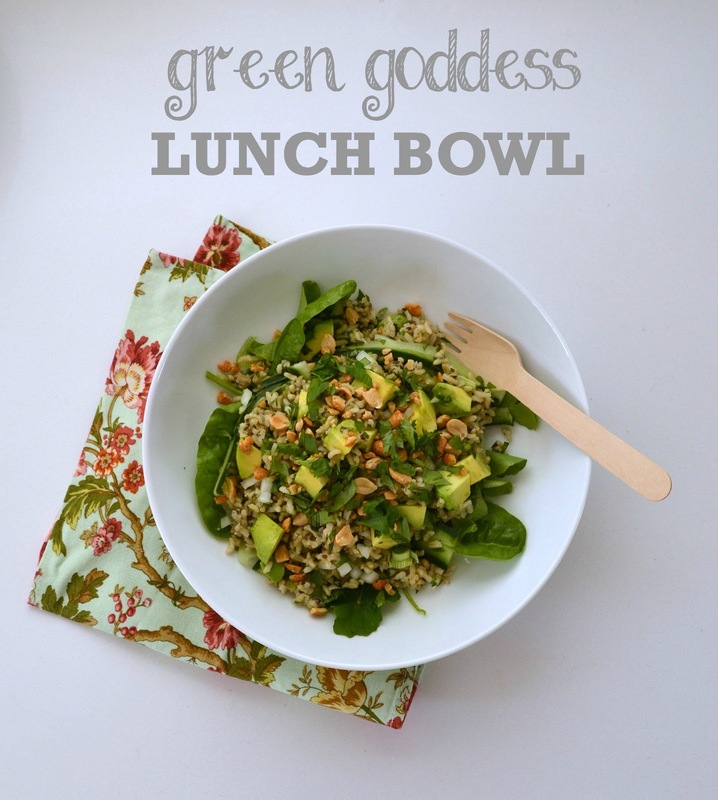 Kate shares a Green Goddess Lunch. There are so many greens in here that I don't know where to start, but I must - there is rocket, cucumber, parsley, spring onions, spinach and avocado. Now that is goodness in a bowl. Dom from Belleau Kitchen brings to the table something a little more warming, but seasonal with this Courgette, Lemon Thyme and Gem Lettuce. Now don't you just want to tuck in, I know I do. Emily from Cooking for Kishore cooks up a Rainbow Chard and Egg Pie with Feta. Now how good does that look?! 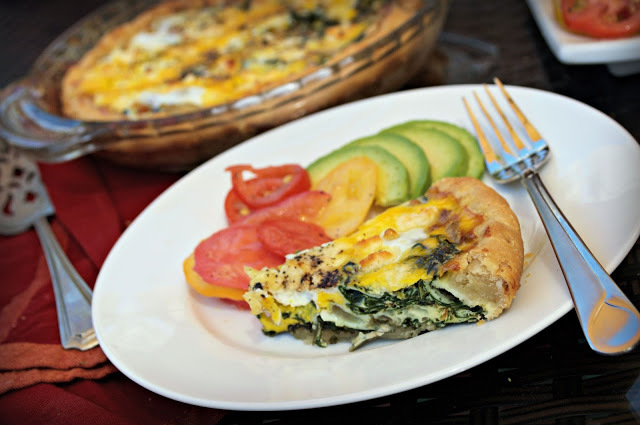 Perfect for any time of day, especially brunch. The Veg Hog shares with us Mushroom and Pearled Spelt Cabbage Roulades. I'd be well impressed if this was presented to me and made with such love too. Little bundles filled with goodness. 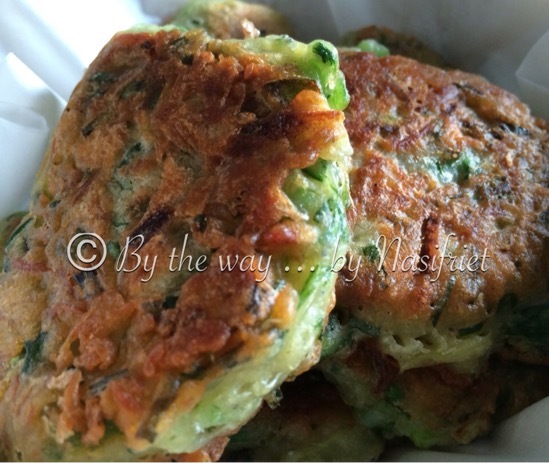 We have some tasty crunch Green Fritters from Nasifriet at By The Way.... made with coriander, chives, green paprika and chillies. Nasifriet describes these are her green eyed monster fritter, want to know why - then go on by her blog. 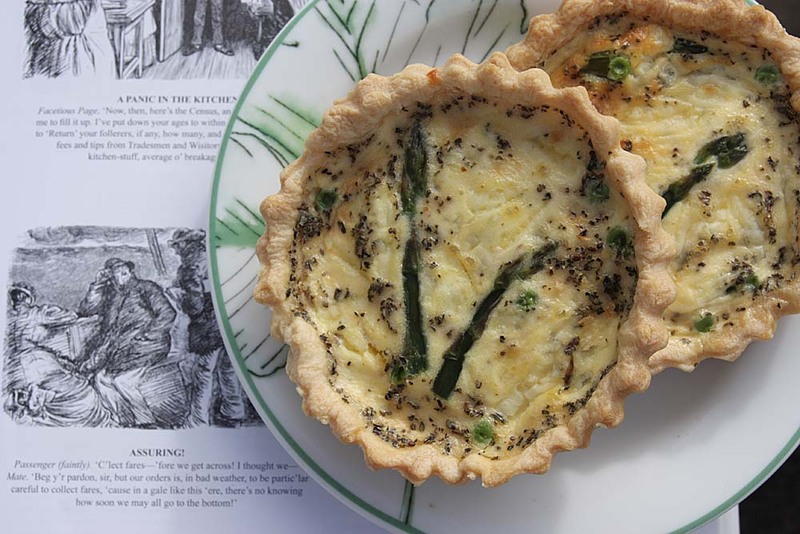 And finally, my own contribution to Eat Your Greens - a Green Quiche made from asparagus and herby mint. Please go by and check each contribution, I know my fellow bloggers would appreciate it. 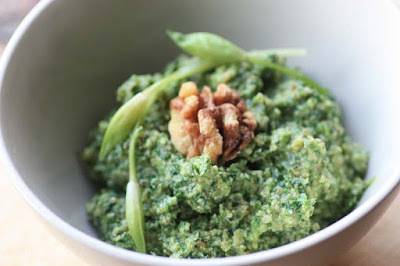 Also I am welcoming #EatYourGreen recipes for August. Follow this link on how to participate. 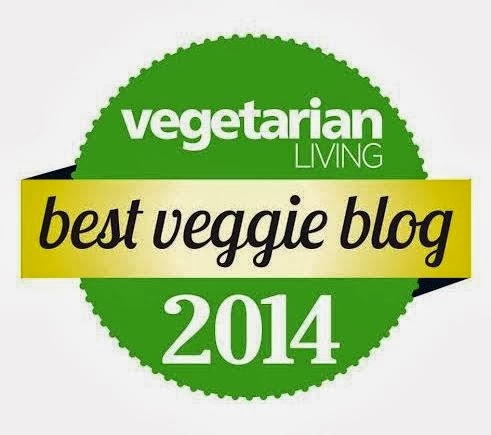 I hope you will also be able to join in the Vegetable Palette challenge too, the theme is More Glorious Reds. Also welcoming #FruitPalette recipes. There is a lot of inspiration here. Thank you very much for the round up! Not only are these guys delicious looking, but also created and presented very tastefully (pun intended!)! Thanks to the hosts - Arija, Gattina, Lady Fi, Sylvia, Sandy & Jennifer.